One of the staple things we had growing up was fresh, frozen and salted cod. Here in Nova Scotia haddock reigns supreme, but nothing to me beats the taste of a fresh out of the water cod. Generally the casual fisher back home used a hand line with a traditional or Norwegian jigger. We’d lower the line overboard till it hit bottom and then pull up a fathom or two and start jigging back and forth till we hit a fish, then we’d pull it up and into the boat to be immediately cleaned. I can still remember the feeling when you hit a big one, or as dad called them, a growler. You’d be jigging the line back and forth and then suddenly you’d bring up solid. Sometimes they were so hard to pull in. And if you happened to hook a mackerel well, then your line was on times tight and then loose as they’d swim madly like a fly fish. And of course in the days before nylon line, we’d have the older cord, everyone had notches in the gunnels of their boats where the line wore into the wood. This one year, for whatever reason, dad decided to try a trawl. Essentially it was a line with 50 smaller lines attached, with baited hooks on each. We set it out near our marks somewhere and came back a day or two later. Well we were pulling it in and caught a few fish, and then… it appeared. 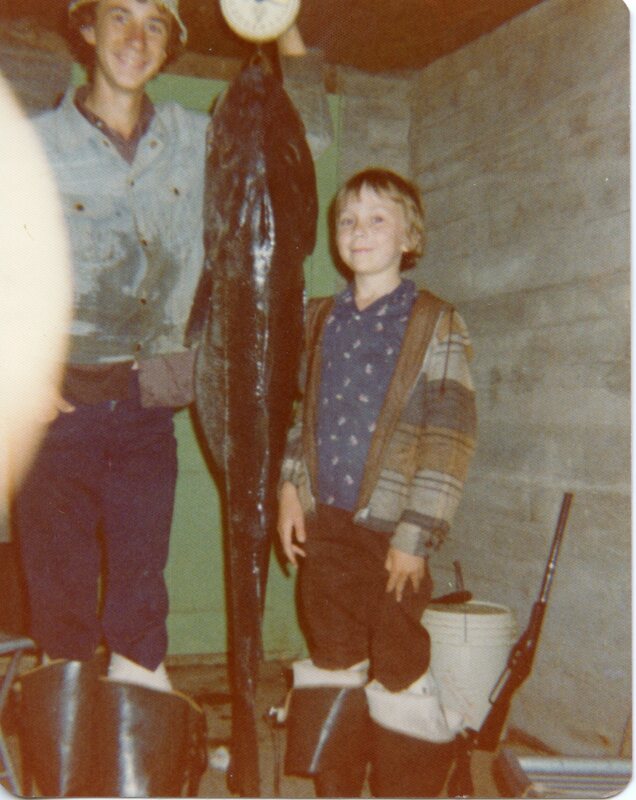 As you can see on the left, the fish was bigger than me! This was probably about 1974 or 75 I think, I’m pretty sure it was before my sister was born, making me 9 or 10 in this picture. The cod weighed in at 65 pounds! We cleaned it and tried to salt it, unfortunately it was so thick it didn’t take well, or we didn’t leave it long enough, and some spoiled, but we still got quite a few meals! Trick or Valentine? Fruit chips ahoy!